Tiny little purple grapes — affectionately called “Champagne Grapes” — are making their way into supermarkets now. These are super-sweet “table grapes” — meaning they are for eating, not used to make wine. You might see them labeled as Champagne Grapes, Black Corinth Grapes or Zante Currants. Whatever you call them, they are delicious, and fun to eat! 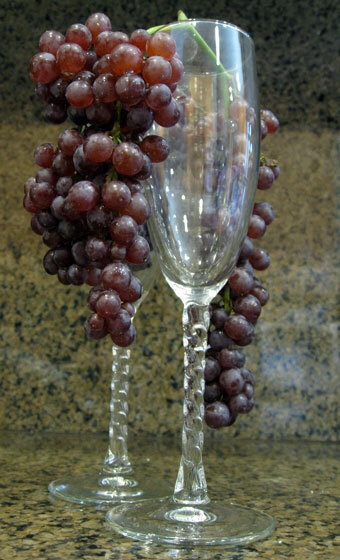 The best way to enjoy tiny Champagne Grapes is to hold a bunch and nibble each little grape with your mouth. The little bunches are so cute that they can actually fit inside a Champagne flute. The perfect fruit for parties, whether adorning glasses of bubbly or decoratively draped across fruit and cheese platters. Check out this recent blog post about Champagne Grapes from Frieda’s CEO, Karen Caplan.